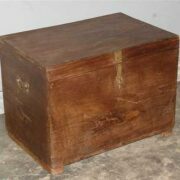 This Vintage Teak Trunk has been beautifully finished with Camel Bone Inlay. 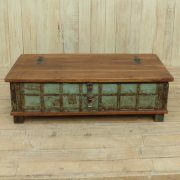 This gorgeous vintage teak trunk was crafted in Jodhpur, Rajasthan many years ago and exudes history, culture, place and people. A most attractive piece of Indian furniture has been skillfully inlaid with camel bone adding further to it’s character, presence and charm. 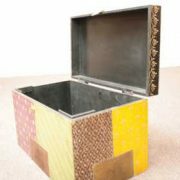 The trunk also has brass fitted brackets adding to it’s strength and look, while also an attractive brass hasp for security. 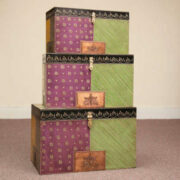 A most desirable trunk that could be used throughout the home.